As the ambassador for the Order of Malta to the Zarina Catherine II, Count Jules René Litta had the opportunity to discover and further develop the secrets of vodka (“small water” in Russian) with the master distillers of the Imperial Court. Based on aristocratic tradition and following his instinct he created his own recipe for a perfectly smooth vodka. The recipe stayed in the Litta Family as a well guarded secret over the generations. In 1998, the Marquis Eugenio Litta Modignani, a descendent of Jules René Litta, decided to launch TOVARITCH!™ vodka following his ancestors recipe. 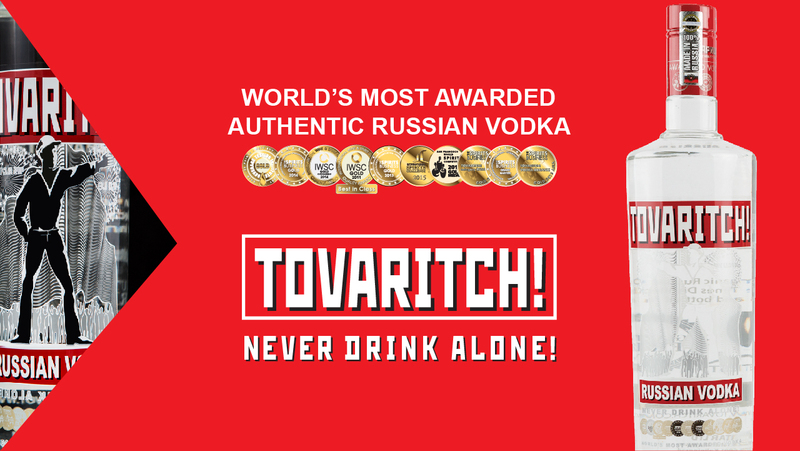 Tovaritch means friend, buddy or compadre in Russian, perfectly accompanied by the brand slogan of 'Never Drink Alone'. In their quest to produce the best in class vodka, the Tovaritch team controls every part of the product from selecting seeds to distillation and bottling. This has resulted in Tovaritch winning over 100 awards to-date and counting. Made with 100% organic (GMO and gluten free) spring wheat and rye sourced in the Volga region which is known for its lavish harvests of high-grade grain. It is bottled at 38% proof respecting Russian tradition, distilled five times and filtered twenty times through a combination of birch charcoal and silver, delivering a medium bodied dry vodka. Another key element of this high-end vodka is the water, which accounts for 56% of the quality of the final product. Tovaritch uses water from an underground well which passes through sand filters to remove iron and softened through sodium-cation exchange filters. Any remaining inorganic solids are removed by a reverse osmosis treatment.